The label on the plastic clear package reads ‘Original Irish Porter Cheese’ and the ‘Irish’ in the name is not merely a fanciful marketing ploy as the product is made by the Cahill’s Farm cheese manufactory in County Limerick, Ireland. Being marketed in Canada, however, everything else on the package is printed in French as well as English and interestingly enough, although the English ingredient list includes ‘Porter‘, the French actually specifies that ‘Guiness’ is used. 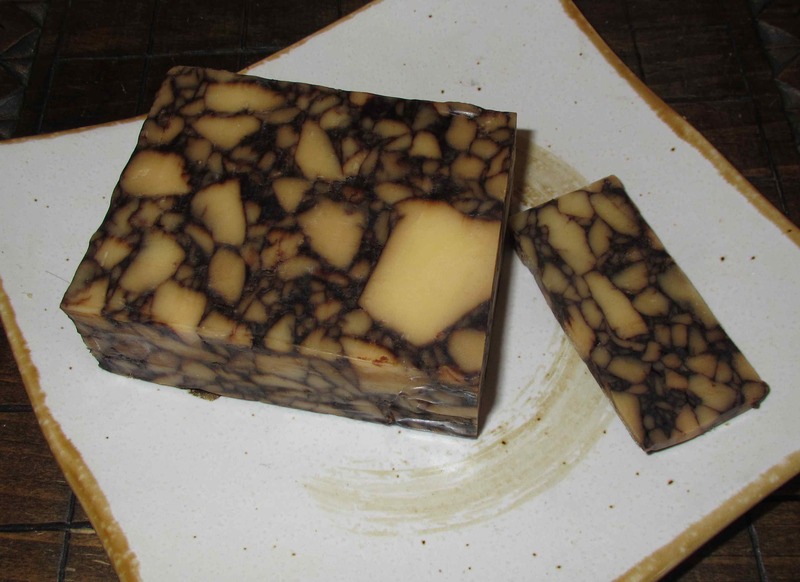 Guiness and other stouts or porters are something of an acquired taste, but I am quite fond of them and was interested to see how it would work in a cheese product. The aroma of the freshly opened package was rather unremarkable – a cheese smell, obviously – but there was no particular sharpness or unusual notes. The taste, as best as I can describe it, is more like a fairly ordinary cheddar than anything else I could think of. It is moderately sharp, and there is a slight pungency at the outset but, again, there is nothing especially remarkable. In a blind tasting, I would say it would be difficult to guess at the presence of the stout but, once you know it is there, it is possible to detect a faint, slightly sweet, burnt taste that characterizes the beverage. It is alright, I suppose, but not likely to accrue any sort of cult following, I wouldn’t think.